Former Aberdeen chairman Ian Donald has retired as a club director, ending 24 years in the boardroom. Donald, chairman for four years from 1994, will become honorary president. Present chairman Stewart Milne told his club's website: "Ian's departure has been accepted with much regret and signals the end of an era for AFC. "We would welcome hearing from anybody who believes they have the necessary skills and commitment that would benefit the club." Milne revealed that Aberdeen were already speaking to several potential candidates to replace Donald. "Ian has been an incredible and loyal supporter of the club," he said. "He has personally contributed a huge amount of time and financial resources to the club over more than 20 years. "I will miss his support on the board but am confident that his unrivalled knowledge and experience will still be available to us as he will be taking up an honorary role, with the title of president in which Ian will continue to act as an ambassador for the club." 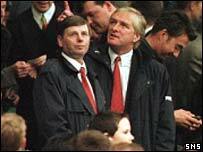 Milne suggested "there is a recognition that, in the current challenging climate, there is a need to broaden the strengths of the club at board level" following a season in which the Dons currently lie second bottom of the Scottish Premier League. "Nobody is under any illusion that this has been an extremely poor season and way below the standards this club sets itself," he said. "Although we have demonstrated on occasion that we can compete with the best, the league table doesn't lie and we are all looking for a substantial improvement next season. "Over the next few weeks, we will be working on our plans for moving forward so that we can approach the new season with a far greater degree of optimism." Milne promised continued support for manager Steve Paterson. Donald, whose family is steeped in the history of Aberdeen, has also vowed to continue to help the club. "The club has been experiencing tough times of late, but I firmly believe further success is not that far away," he said. "I believe I have a substantial amount to offer and my role as president will hopefully allow me to open new doors that will prove beneficial to the club." Donald, chairman and managing director of JF Donald (Aberdeen Cinemas) Limited, joined the club's board as a non-executive director in 1980 and, after being chairman, became vice-chairman in 1998. He also served on the council of the Scottish Football Association and the Scottish Football League.